Once upon a time there was a sweet little Sheltie. Whoever laid eyes on her could not help but to love her. 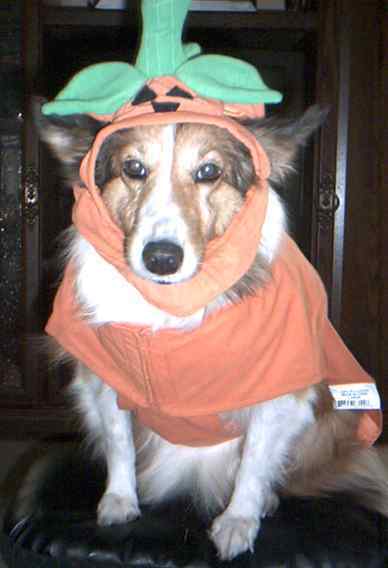 Her Mother, being her biggest fan, bought her a Pumpkin Costume from Petsmart and that is how she became known as "LITTLE SHELTIE PUMPKIN HOOD". One day her Mother ask her to take some brownies (made by her aunt ALICE's recipe) and some ginseng tea to her Grandmother's house. Her Mother warned her to stay on the path so she would not get lost in the woods. "I'll do just as you say" promised Little Sheltie Pumpkin Hood. She followed the path into the woods and had only been walking for a few moments when she ran into a wolf. She did not know what a wicked sort of animal he was so she was not afraid of him. "Good Day" said the wolf. "Where are you going so early" he ask her? "To my Grandmother's house to take her these brownies and tea" she replied. "Where does she live" ask the wolf ? "About another half and hour from here" said Little Sheltie Pumpkin Hood. The wolf thought to himself, This tender young thing is a juicy morsel. She'll taste even better than the old woman. You've got to be real crafty if you want to catch them both. Then he walked next to her, and after a while he said, just look at all the beautiful things around that you. I think you should take some time to enjoy them. Little Sheltie Pumpkin Hood looked around and saw how the woods were full of beautiful flowers. So she thought to herself, If I gather a bunch of fresh flowers and other natural things...I could make Grandmother some Native American crafts on the way to her house, she'd certainly like that. It's still early, and I'll arrive on time. So she ran off the path and plunged into the woods to look. She plucked one and then she thought she saw another even prettier flower and ran after it, going deeper and deeper into the forest. But the wolf went straight to the grandmother's house and knocked at the door. "Who's out there?" ask her Grandmother. "Little Sheltie Pumpkin Hood. I've brought you some brownies and tea. Open up." "Just lift the latch," the grandmother called. "I'm too weak and can't get up." The wolf lifted the latch, and the door sprang open. Then he went straight to the grandmother's bed without saying a word and gobbled her up. Next he put on her clothes and her nightcap and lay down in her bed. Meanwhile, Little SheltiePumpkinHood had been making a dream catcher for her Grandmother when she noticed that it was getting late and continued on her way again. She was puzzled when she found the door open, and as she entered the room she called out, "Good morning!" There lay her grandmother with her cap pulled down over her face giving her a strange appearance. "Oh, Grandmother, what big ears you have!" "The better to hear you with." "The better to grab you with." Grandmother, what a terribly big mouth you have!" No sooner did the wolf say that than he jumped out of bed and gobbled up poor Little Sheltie Pumpkin Hood. After the wolf had satisfied his desires, he lay down in bed again, fell asleep, and began to snore very loudly. Jerry Garcia and Janice Joplin's SPRITS happened to be passing through the woods and felt that something was terribly wrong. They entered into the room, went to the bed, and saw the wolf lying in it with something moving inside him. Jerry Garcia took some scissors and started cutting open the sleeping wolf's belly. After he made a couple of cuts, he saw the little orange cap shining forth, and after he made a few more cuts, the little Sheltie jumped out and exclaimed, "Oh, how frightened I was! It was so dark in the wolf's belly." Soon the grandmother came out also. She was alive but could hardly breathe. Little Sheltie Pumpkin Hood quickly fetched some large stones, and they filled the wolf's body with them. When he awoke and tried to run away, the stones were too heavy so he fell down at once and died. Everyone was quite delighted. Jerry Garcia skinned the fur from the wolf for Little Sheltie Pumpkin Hood to make Native American Crafts with. Janice Joplin sang to grandmother while she ate the brownies (made by Aunt ALICE's recipe) and drank the ginseng tea., Soon Grandmother regained her health. 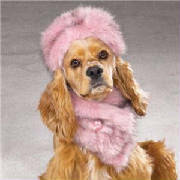 Meanwhile: Little Sheltie Pumpkin Hood was so greatful to have been saved by such Wonderful people....she decided to take singing lessons and become a contestant on American Idol. Take a nighttime stroll through the Garrison House, the scene of a ghastly murder-suicide. Keep your eyes and ears open... the restless dead haunt the darkened rooms and halls of this screen saver. Pay close attention, as you may see or hear something from beyond the grave. But please, never EVER watch this screen saver at night while alone in a darkened room. What more could a pup want ?